Solar energy is being used in a broad range of applications across industry and residences alike. From heating water for home use to creating utility scale electricity – solar energy application is growing. Understanding the basics of how we can harness solar energy is essential for technicians, engineers, installers, designers, builders, and others who want to apply solar technology either professionally or personally. Amatrol’s Solar Concepts Learning System (950-SC1) introduces learners to a broad range of basic concepts in solar energy and technology. Photovoltaic and thermal solar systems are introduced to students. They learn how to translate location, sun, and technology into practical applications. The Solar Concepts Learning System acts as a foundation for students in solar technology. Solar Concepts includes student curriculum in a highly-interactive, multimedia format. Amatrol’s interactive multimedia provides an engaging, stimulating experience for learners. The Solar Concepts Learning System includes interactive computer-based instruction with both theory and hands-on tutorials consisting of text, digital video, voice, online self-review tests, interactive simulations, color diagrams, and color photos. Amatrol’s strong interactive multimedia includes visual, auditory, and text based learning styles to reinforce each other in well-organized learning segments. Using Solar Technology to Capture Solar Energy -Location Makes a Difference! Siting a solar array or understanding how much energy you can capture from an array in a specific location requires a strong understanding of all of the variables therein, which is provided by Amatrol’s Solar Concepts Learning System. The type of application also plays a strong role. With this system, learners study how to site an array with optimum orientation as well as determine the insolation, which varies significantly from place to place. 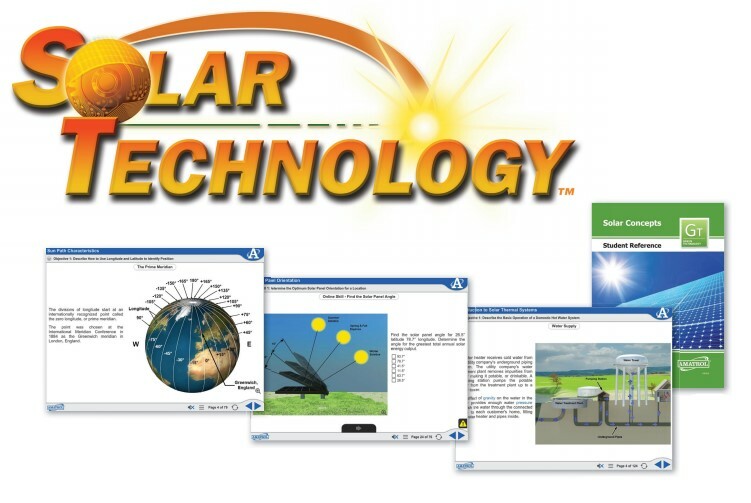 The Solar Concepts Learning System teaches learners to use a variety of instruments required to apply solar technology. These virtually developed skills can be reinforced with hands-on application through the optional Solar Instruments Package (95-SIP). The package contains a pyranometer, global positioning system (GPS), inclinometer and compass. Learners will study how to translate their virtual skills to the actual instruments and apply them to solar technology systems. All of these are required to properly orient arrays.